The Suzuki Makai Concept car would surely catch the eye of beach goers. 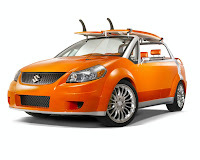 The Suzuki Makai is part of Suzuki's LIVE Series concept cars and it got its looks from the 2008 Suzuki SX4 sport except the Makai is an open air vehicle rather than a sedan. Aside from its eye-catching orange colors, the Suzuki Makai has a custom surfboard mounting rack, shaved windscreen, targa rear hoop, al fresco cabin, an integrated Garmin navigation system, Kinetik Power Cell battery, StreetWires audio/video install kit and cabling, Momo Sport steering wheel and color-keyed interior accent lighting are some of the features of the Suzuki Makai that would sure appeal not only to beachgoers but outdoorsy types as well. Heck, I want one just for its sunset orange color alone.